Some pets tend to be wary of suddenly having to share their cozy abodes with a furry new addition — but clearly not Molly. When the bighearted pit bull's compassionate human brought home a kitten he'd rescued one day, it was love at first sight. Within seconds of being introduced to her tiny new sister and receiving her with a few curious sniffs, Molly bursts into a happy, squirmy dance — like a balloon so full of love it had sprung a leak. "Let this video serve as proof that (if raised correctly) pitbulls can be the sweetest dogs in the world!" 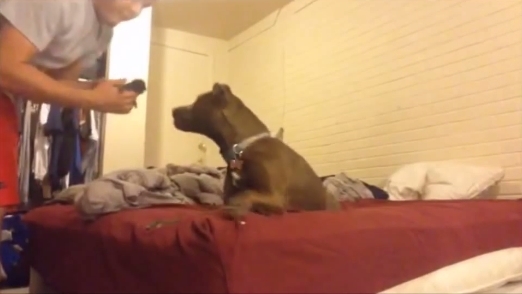 Responses to "It's Love At First Sight For Pit Bull Meeting A Tiny New Kitten"